Roll downs and the journey into the spine and the spaces in between. Spinal rolls – Rolling down the spine from a well constructed Tadasana is one of the most important journeys to take into the body. Standing in Tadasana, feet hip width apart, knees over feet, stacked under the hips. Drop the chin to the chest and observe how the path of the breath changes, as the front of the body is constricted the breath flows into the back of the body, opening the space between the Scapulars. Then begin the journey down. Pausing on the inhalation (creating a larger surface area in the body, making it easier to observe) and moving on the exhalation. Sacral descending … at the sacral area we observe the stretch move into the legs, this is an interesting place to observe as it shows us and gives us information on the connection point between these two major parts of the body and how they work together. Allow knees to be soft. I like to think of a bent knee in a straight leg. 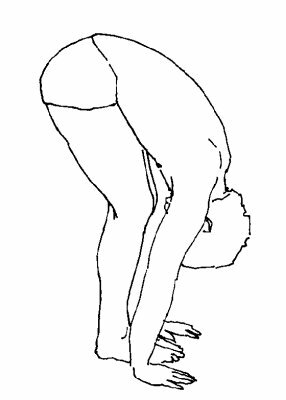 At the bottom of our roll we have Uttanasana our forward facing bend. Be gentle here, there is alot of time in a practice to explore the hamstrings in Uttanasana, but on a spinal roll keep it soft. The journey up the spine starts with a yield into the feet and a counter impulse of push. By allowing the the feet to act as the stable point between these two counter forces we can use weight and proper use of structure to create a safe and pleasurable accent. tilt pelvis (posterior) and unfurl the spine. Doing the upward movement in this way takes pressure off the spine and puts it into the quadriceps, these muscles have no problem lifting the upper body making this not just an enjoyable way to roll up, but a very safe way to ascend. With the correct attention this movement is a class in itself.